Summer signals the start of many out-of-town trips and well-deserved breaks with family and friends, often to bask under the sun while in pristine beaches or to chill out in cooler spots. With their refreshing vibes and relaxing environment, these go-to locations are sure to provide everyone momentary relief from the daily grind and busy streets of the metro. With summer just around the corner, destination planning is underway and along with it, the best pit-stops for that essential stop-over. Pilipinas Shell ushers in the summer season by welcoming motorists to stop by at any station and make their trip more enjoyable through delightful customer offers. Fueling up becomes more fun as customers get a Summer Journey Card and collect stamps for exciting prizes with every purchase of Shell V-Power Nitro+ fuels worth Php 1,000. Up for grabs are cool summer treats and discounted premium items with every visit, including a chance to win fuel and Shell Select vouchers, refreshments, or a trip for two to top luxury resorts in the country –Lagen Island El Nido, Shangri-la’s Boracay, or Siargao Bleu. Summer journeys are also made special when customers visit participating Shell Helix Service Centres & Shell Helix Oil Change+ outlets. For every oil change using Shell Helix Ultra, Shell Helix HX7, Shell Helix Diesel HX7, or Shell High Mileage, customers can avail of a foldable director’s chair or a dry bag to complete their summer gear. Motorcycle riders can also join in the fun with the exciting prizes that come with every purchase of Shell Advance products. Customers can get a free Shell Select or Shop Beverage Voucher for every 2L purchase of Shell Advance Ultra or Shell Advance AX7. Moreover, SM Advantage, SM Prestige, and BDO Rewards members can also earn points while Shell Citi Visa cardholders will get rebates with every purchase at Shell service stations. To further enhance their summer getaway, refreshing and delicious snacks, beverages and meals await customers in Shell Select and Deli2Go outlets. “Shell has been a partner of every Filipino’s summer journey over the years. This time, we want to fuel their excitement during this season and create something that they can look forward to every time they visit Shell. We always want our customers to make the most out of their stops at our stations. This is why we’re really excited to recharge their journeys through our different summer offers,” says Anthony Yam, Pilipinas Shell’s Vice President for Retail. This special summer offer is valid from March 1 to May 31, 2017 at participating Shell stations nationwide. 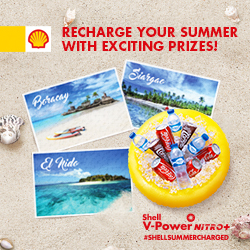 Customers can visit the nearest Shell station or log on to shell.com.ph/rechargethissummer to know more about this offer.